The ‘equal share in the burden’ camp calls to stop trying to replace the Tal Law, and simply draft everyone. Move could mean mass arrests. The “Equal Share in the Burden Camp” has called to simplify the process of replacing the Tal Law by simply not replacing the law at all. 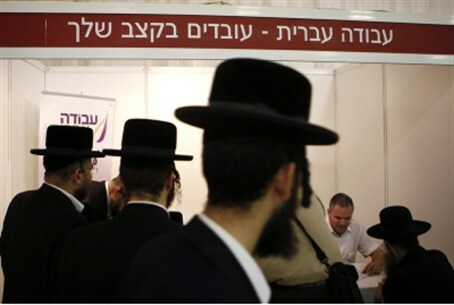 Instead, hareidi-religious men should be drafted when the law expires in August like all other non-Arab Israeli men, the group suggested Sunday. “Our proposal to [Defense] Minister Barak is to give explicit orders, in accordance with the High Court’s decision, to draft all 18-year-olds to either military or civilian service beginning on August 1,” it proposed. The suggestion is one most lawmakers are seeking to avoid due to the potential for mass arrests. If hareidi men were drafted and refused to enlist, they could be jailed for draft-dodging. The Equal Share group expressed disappointment in Vice-Prime Minister Moshe Yaalon over his proposal regarding hareidi service. Yaalon presented a compromise deal Sunday under which additional incentives would be given to those who serve, hareidi men would have to choose a service track at age 23, and those who did not enlist would suffer personal sanctions beginning at age 26. “It’s embarrassing to see a former Chief of Staff sell out those who serve for an incomprehensible political deal with the hareidi parties,” spokespeople for the group said.